This morning, when I went to prepare my customary cup of black tea with milk/cream/soy milk/coconut half & half, I realized I was out! Since I needed caffeine and I wasn't in the mood for green tea, the only logical choice was puerh. 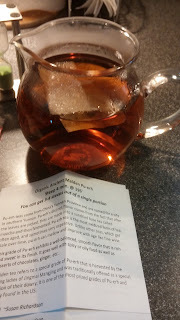 I happened to have some Maiden Puerh sitting around that was given to me at the annual coffee and tea exchange party I host for my Tea and Conversation with Friends meetup group ( http://www.meetup.com/Coffee-Tea-and-Good-Company/ ), so I thought I'd give it a try. 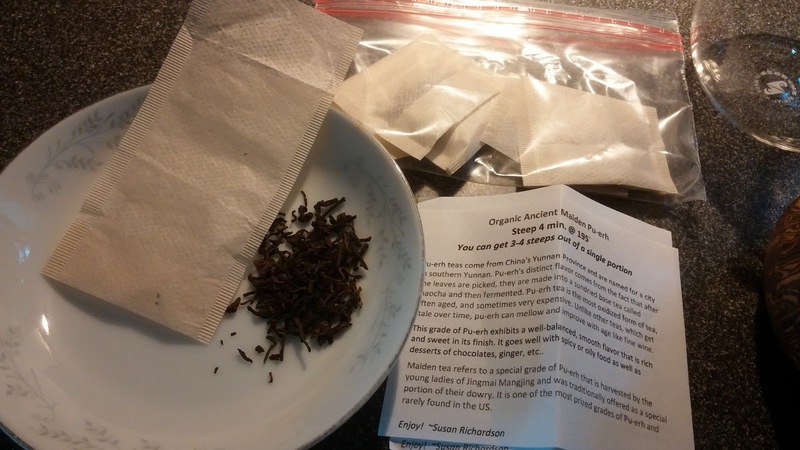 As you can see from the photos, the nice person who gave me this tea typed up a little info sheet on puerh for those at the party who were unfamiliar with this type of tea. Puerh is a "post-fermented" or aged tea, which means that it goes through one more process after the oxidation and drying of black tea. Like good cheese or a fine wine, puerh is fermented with bacteria, yeast and mold, which gives it a distinctive flavor that's not everyone's "cup of tea". 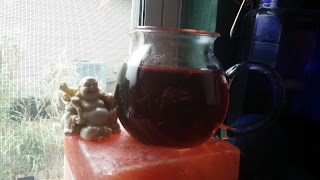 Also like a good cheese or fine wine, puerh actually gets better with age. I steeped this one at 200 degrees F for 4 minutes. The dry leaves had that distinctive puerh smell that reminds me of compost tea, or my kitchen when I forget to take out the trash. By contrast, the flavor of this puerh is actually rather mild and smooth, with only a hint of that "compost pile" flavor. As you can see from the photo, the liquor has a rich, coppery color. The woodsy notes are quite pleasant. A second steeping produced the same forest floor flavor, albeit milder. I am going to save the leaves for a third steeping, so stay tuned!